Check out this intriguing "musical" which has the potential to open up a whole new world of cognitive and aural discovery. 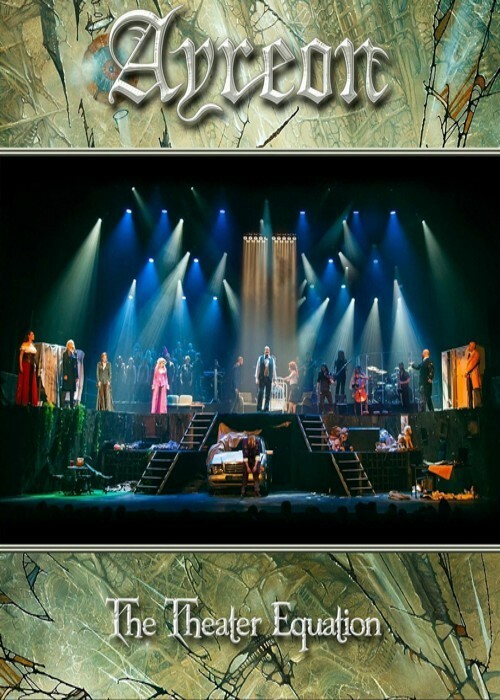 'The Theater Equation' is a DVD/CD package that offers a unique 2015 live performance of Ayreon's 2004 album 'The Human Equation' and the brainchild of Arjen Lucassen. In short, it's a Rock Opera of stunning breadth and ingenuity, performed here by an all-star cast. While some of Lucassen's more space-enthused science fiction might have more limited appeal, 'The Theater Equation' is more grounded in everyday human significance. The story goes something like this; A cut-throat business type is involved in a mysterious car accident and falls into a coma. His condition induces a twenty day psycho-drama, with various emotions and facets of his character playing out a complex inner struggle as our victim and hero tries to come to terms with who he is, his family past, his relationships, his life choices, betrayal and infidelity. At stake is his will and determination to emerge from the coma and resume life as a stronger, wiser and better man. Each day of the struggle is marked by a different track, as we move from 'Vigil' and 'Isolation' to 'Realisation', 'Disclosure' and 'Confrontation'. The album's twenty tracks run together and are presented here in two seamless and flowing Acts. Lucassen has managed to reassemble many of the album's original vocalists, including James LaBrie as the lead character, Marcela Bovio as his wife, Heather Findlay as 'Love', Magnus Ekwall as 'Pride', Irene Jansen as 'Passion', Devon Graves as 'Agony' and Eric Clayton imperious in his Geoff Tate-like delivery of 'Reason'. In some interesting changes from the original, Mike Mills is extremely entertaining in the dual role of 'Rage/Father', while Mikael Åkerfeldt is replaced by Anneke van Giersbergen who brings her incomparable talents and a neat gender switch to the role of 'Fear'. Lucassen passes up his own role as 'Best Friend', his place taken by a chilled looking Jermain van der Bogt. Musically, Lucassen has assembled a fine band around long-time collaborator Ed Warby (drums), with guitars provided by Marcel Coenen and Freek Gielen, keyboard and synth duties shared by Erik van Ittersum and Ruben Wijga with Johan van Stratum on bass. Jeroen Goossens (flutes and woodwinds) reprises his studio role, with the band completed by Maaike Peterse (cello) and Ben Mathot (violin). The band is held constant for the full performance, without the numerous cameos of the studio version. Strings, flutes and woodwind instruments blend perfectly with more conventional Rock instrumentation, producing a passionate and, at times, beautiful musical tour-de-force – a typical Lucassen blend of Classic Rock, Prog, Folk and Metal. There are superb performances throughout, and the production is extremely well staged. The whole set is open to view, and there is always something interesting going on, whether musically, vocally or visually; at times, there's even a touch of 'Les Misérables' about proceedings. The band occupy a fixed position at the back of the stage, while the multi-level set is supported by back screen visuals. Also compelling here is the contribution of a nineteen strong rabble-rousing "Epic Rock Choir". Lucassen himself finally puts in an appearance at the end, looking a bit like a Garth stunt double from Wayne's World in a suit that could be taken for a pair of sparkly pyjamas. He's clearly his own man, and I guess ours is not to reason why. The human equation, indeed! Fans of Lucassen and Ayreon will lap this up. Those unfamiliar with his work are encouraged to check out this intriguing "musical" which has the potential to open up a whole new world of cognitive and aural discovery.